UPDATE: if you intend to go, dress appropriately. meaning, wear as little as possible because it is so damn HOTHOTHOT inside the tent. as in walang air-con. but there are some pretty good bargains to be had, especially from sports brands like mizuno, puma, umbro, pacsports, etc. 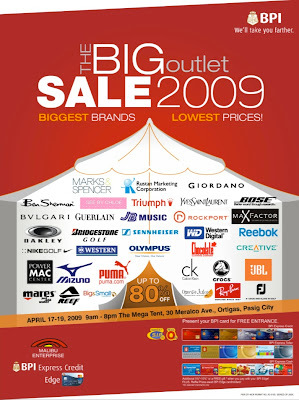 don't miss the booths of paul smith/ben sherman/dotdotdot, natori, marks & spencer, giordano, crocs, and mac. bring your BPI cards (credit and ATM) because they'll get you in for free! otherwise it's 50 bucks.